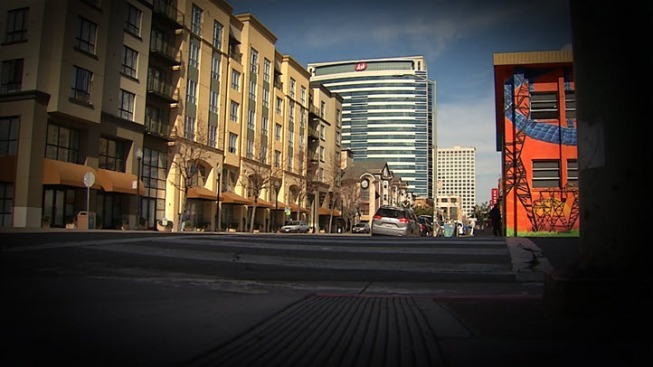 A six-month NBC Bay Area investigation found a growing economic disparity between different areas of Oakland. It’s a gap that research scientists say is contributing to continuing violent crime in some parts of the city. While overall, the crime rate has fallen in recent years, a closer breakdown of the data by NBC Bay Area’s Investigative Unit discovered that some communities are still plagued by violence. In many parts of Oakland the economy is booming. But in the city’s historically marginalized neighborhoods the data shows the rising economic tide, so far, is not lifting them up. Instead, US Census data shows that in many cases the rising economy is actually pushing them out. In areas where violence continues to be a serious issue, such as parts of East and West Oakland, the latest census data shows high rates of unemployment (17.06 percent), low education levels and more than 30,000 residents living below the poverty line. The average household income in deep East Oakland ($47,318.50) is only a little more than half the citywide average ($80,758.00). Experts who spoke with NBC Bay Area say violence, a symptom of an unhealthy community, will continue to affect those neighborhoods until they’re provided the same access to opportunity as the residents living in thriving Oakland communities nearby. In an interview with the Investigative Unit, Oakland Mayor Libby Schaaf said reducing violence is her top priority. Solving the problem will take a holistic approach which she said means smart policing, but also opening up pathways to education, jobs, and affordable housing. But Oakland isn’t there yet. In places like deep East Oakland, where gun violence continues to be an issue, the latest census data shows 18 percent unemployment. Only 9.1 percent of residents hold a college degree. Contrast that with the Oakland Hills where more than 75 percent of residents have a college degree and the average household income has risen above $188,000. In that same area of deep East Oakland, police data shows there were 26 murders and 90 gun arrests between August 2015 and May 2016. Crime is down across Oakland, but gun violence continues to be a problem in communities such as East and West Oakland. Oakland Mayor Libby Schaaf says access to education and economic opportunity for all Oakland residents is the key to reducing violence. This map shows the opportunity gap that exists when neighborhoods affected by violence, such as Deep East Oakland, are compared to peaceful ones, such as Oakland Hills. Coach Todd Walker knows firsthand what can happen when institutions fail communities. 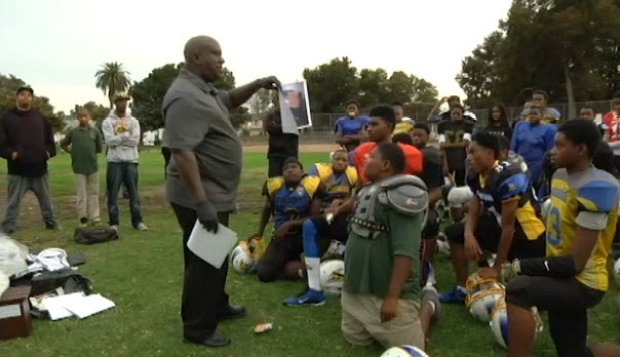 He’s volunteered as a youth football coach for 20 years but earns his living as a funeral home assistant. Walker, who coaches football around the fields of Oakland, said he’s buried more than 20 of his former players over the years, mostly teenagers. Todd Walker, funeral home assistant and youth football coach, talks about his methods of educating young people about the dangers of gun violence. Pinderhughes said kids in these neighborhoods can be set up to fail at a young age by the very institutions meant to help them. He calls it structural violence. But Pinderhughes said cities such as Oakland are now coming to the realization that preventing violence isn’t just about more cops on the street. Mayor Schaaf agrees, and said she’s dedicated to addressing the underlying causes of violence. She points to the fact that half of Oakland residents are asset insecure, meaning they don’t have enough savings to live above the poverty line for three months. She said her administration is rolling out initiatives to aggressively deal with these issues, such as spending $23 million on Oakland Promise, a program that gives babies born into poverty a $500 college savings account. Schaaf also touted a partnership with Kiva Zip, a non-profit organization that provides zero interest loans for entrepreneurs who otherwise wouldn’t be able to secure a one. “We believe in ten years we will triple the number of Oakland students who graduate from college,” Schaaf said. But Pinderhughes worries that the residents who have lived through years of violence and poverty in some of Oakland’s communities won’t be around when those areas are restored to health. He points across the Bay to San Francisco, where he says the African American community has all but disappeared. He said San Francisco serves as an example of what can happen when money floods a city and free market forces are left unchecked, leaving those poorer residents no choice but to pack up and leave. Schaaf said the threat is real, and is one her administration takes seriously. Mayor Schaaf said Oakland leaders also need to strengthen protections for renters and put measures in place to keep a large stock of affordable yet safe and clean housing. Pinderhughes said the clock is ticking, but there’s still time to intervene in Oakland if leaders are willing to take the necessary steps. “It’s a question of the political, social and economic will to make the policy changes and take courageous political action,” Pinderhughes said.